There were 671 press releases posted in the last 24 hours and 153,492 in the last 365 days. ALBANY, NEW YORK, UNITED STATES, March 18, 2019 /EINPresswire.com/ -- Auto/Mate Dealership Systems today announced that its 2019 National Customer User Summit will be held Wednesday, October 23 - Friday, October 25 in Nashville, TN. Additionally, Auto/Mate has issued a call for sponsorships from Open/Mate partners and other industry vendors. 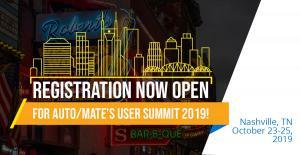 The User Summit spans three days and offers Auto/Mate customers the opportunity to network, attend in-depth training sessions and talk one-on-one with Auto/Mate's software developers.